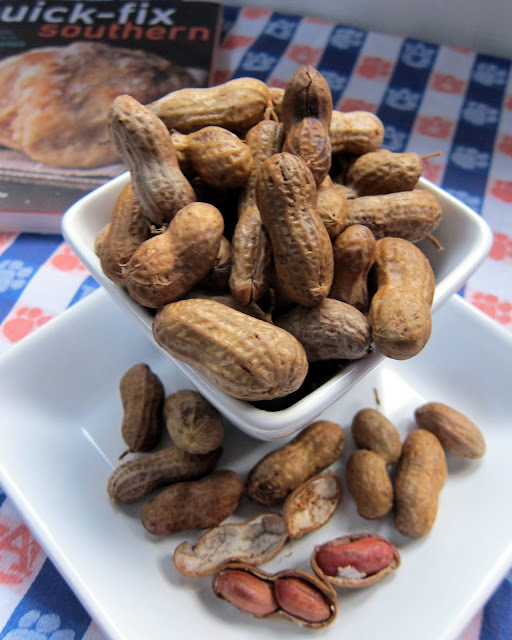 Slow Cooker Boiled Peanuts - raw peanuts, water and salt - put in the slow cooker and let simmer overnight. Add seasonings to water - great with crab boil seasoning, jalapeños and cajun seasoning! Perfect for summer BBQs and football tailgating! I recently received a copy of Quick-Fix Southern by Rebecca Lang to check out. I thumbed through all the mouth-watering recipes, and this Slow Cooker Boiled Peanuts recipe caught my eye. Chicken Legs and I have never had boiled peanuts; I think that might actually be a sin here in the South! We decided to give them a try. I am so glad we did. We both gave the peanuts two thumbs up. Chicken Legs is totally addicted to these peanuts. We took some of them to our tailgate last weekend, and I can assure you that we will be taking some to another tailgate this year. Quick-Fix Southern is filled with over 100 quick and easy recipes. It even has a whole chapter dedicated to tailgating!! If you are in Birmingham, Rebecca Lang will be at Birmingham Bake and Cook Company on Tuesday, September 27, 2011. She will be making several recipes from Quick-Fix Southern, including Stuffed Corn Bread, Skirt Steak with Vidalia Onion Chimichurri, Roasted Tomatoes and Parmesan Grits, and Double Chocolate Scoop Pie! The Double Chocolate Scoop Pie is next on my list to try! The class is $35 and is from 6:30-9:00pm. Contact Birmingham Bake and Cook Company to register. Rinse the peanuts in cold water. Discard the dirty water . Transfer the peanuts to a 6-quart slow cooker. In a large mixing bowl, combine 15 cups of warm water, the salt and oil. Pour over the peanuts. Cover the slow cooker with the lid and cook on high for 20 hours. If the slow cooker lid doesn't fit tightly, check about halfway through the cooking time. You may need to add more water. Drain peanuts to serve. O, don'tchaknow, I am gonna try this. When I was a little girl, street vendors sold these in downtown Dallas. Even at my olden age, I can STILL remember how delicious and warm they were. Thanks for the recipe. Steph, you need to use raw GREEN peanuts! Once cooked the peanuts should be white or grey in color (not red) and SALTY!!!! The peanuts in the picture are red because they still have their skin on. Once peeled, they're white. 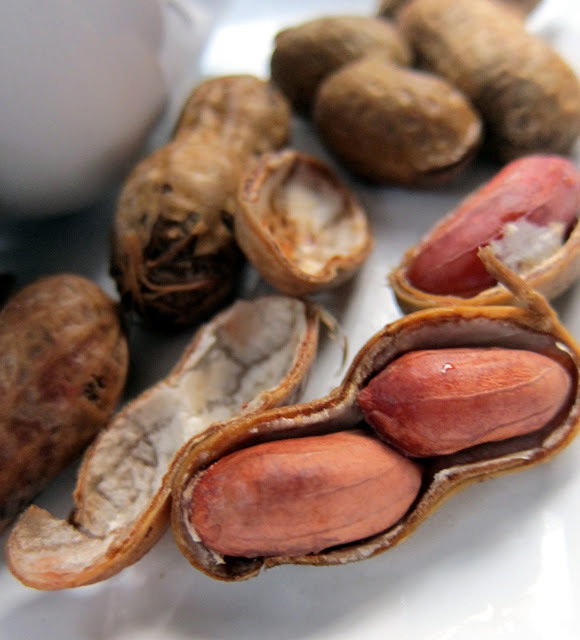 Peanuts do NOT need to be green, but they DO need to be raw. Green indicates a state the peanuts are in from the time they're picked until shortly thereafter when they start to lose their moisture. Almost all of the boiled peanuts you buy elsewhere are made with raw, dried (i.e., not green) peanuts. I am originally from South Carolina, the green nuts do make better boiled p-nuts. We can't get green ones here and i have used the raw nuts you can get in the store. They are ok, but no way as good as green boiled p-nuts. Where did you find that ADORABLE tablecloth?! Hey, that's a neat idea! You GOTTA LUV Dees Nuts ! I'm so surprised you've never had them! The best I've found are at the Peach Park in Clanton. I've never made my own, but I'm definitely trying now! Kristi - I got the tablecloth at the Auburn bookstore on campus. You can find the fabric at the fabric store (at least in Auburn). I have had roasted peanuts always. Very excited to bite these tender slow cooker boiled peanuts. This is pretty Interesting. Now that I've started making Boiled Peanuts in the crock pot, I will never do it differently again. Too easy! I love love love love love love love boiled peanuts! They take forever and a day to cook but they're worth it. I like to throw a bunch of cajun seasonings in with the salt to make them spicy. Chris - we are making a cajun batch right now! Second of all....I am missing my roadside stand boiled peanuts. The best ones are in between Dothan and a little past the Florida state line. Love them. I will be trying this out to get my fix before coming home in July. You can freeze them - YAY!